Sheriff seeks 5-year levy with increase of 46 cents per $1,000 of assessed property value. When the five-year jail operations levy expires at the end of the 2018-19 fiscal year, Jefferson County Sheriff Jim Adkins hopes to have a new five-year levy in place to house the growing inmate population. On the Nov. 6 ballot, Adkins is asking county voters to support a levy of $1.70 per $1,000 of assessed value — up from the current levy of $1.24 per $1,000. The increase is necessary as the county gears up for the loss of a large chunk of its jail operations budget when Crook County opens a new jail sometime next year. Currently, Crook County rents 16-32 beds per day at $76.32 per inmate, per day. For the 2018-19 budget year, Adkins expected to receive about $719,000 in income from Crook County, which originally planned to open its jail in April 2019. The opening has been pushed back to at least July, which will mean more revenue for the current year. "It is very important to pass the levy because of the huge revenue loss when Crook County leaves," said the sheriff. "For the past 18 years, we have been able to keep the jail operations tax much lower than if we didn't contract with Crook County." The total jail operations budget is $6,022,184, out of the total JCSO budget of about $10,275,877. "The commissioners, county administrator and I have worked hard to keep Crook County here and keep the contract, because we thought it was a win-win for us all, but as we all know, the Crook County voters want their own jail," he said. 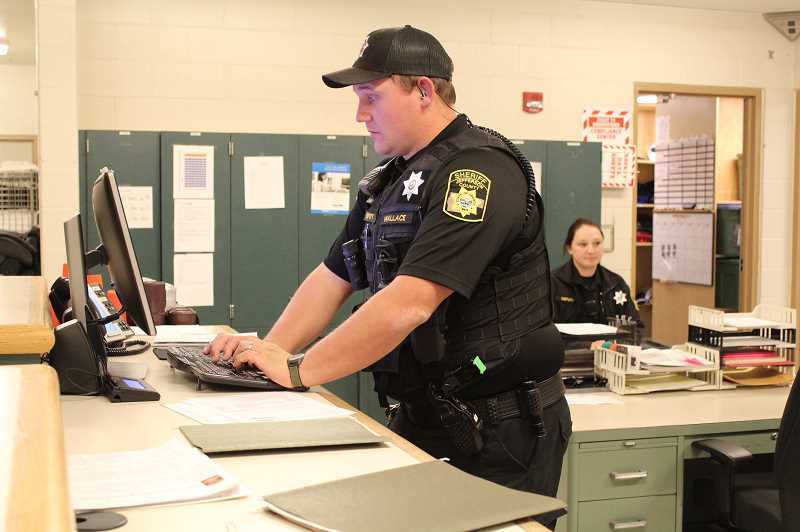 The Jefferson County Sheriff's Office employs 42 personnel, with 23 of those in corrections. "Of the 23, two are emergency positions helping cover for the three deputies who are on paid administrative leave," said Adkins, referring to the three deputies who were charged with criminally negligent homicide for the April 26, 2017, death of an inmate. A trial date for the deputies has been set for Nov. 26. "These two positions will eventually go away, through normal attrition, after the court case against the three deputies is resolved," he said. Since the last operations levy was passed, both the Jefferson County and Crook County inmate populations have increased. Just prior to the last vote in 2013, an Oct. 9, 2013, Madras Pioneer article noted that there were 69 total inmates at the jail — 43 from Jefferson County, 16 from Crook County and 10 from Deschutes County, which was also renting beds at that time. And, three years earlier, the Pioneer noted that jail population was ranging from 65-75, with 16 of those from Crook County. Today, the jail population has increased significantly. "As of (Oct. 21), we had a total of 91 inmates; 25 of those were Crook County inmates, leaving us with 66 Jefferson County inmates," said Adkins. "My jail was built very efficiently and is a modern jail, allowing me to house up to 110 inmates with my current staffing," said Adkins, adding that jail staff currently work four 12-hour shifts, and then have four days off. "Each shift must have a minimum of three deputies, which means I have to have four teams of four deputies to keep the jail operational." Adkins doesn't anticipate that the number of inmates will increase to more than 110, since the jail won't be housing Crook County inmates in the future. "I'm projecting the Jefferson County inmate numbers to range from 60 to 85," he said. "Again, the jail was built the way it was, so we could house up to 110 inmates with a minimum staffing of only three deputies on a shift," said Adkins. "If I must reduce the number of deputies that watch my jail, because of budget cuts, I will have to reduce the number of inmates I can house." If the jail operations levy doesn't pass, Adkins plans to try again on the May 2019 ballot. "My request for $1.70 per thousand is the bare bones minimum I need to the keep the jail operational for the next five years," he said. Adkins arrived at that number with assistance from County Assessor Jean McCloskey, County Administrator Jeff Rasmussen, County Finance Director and Treasurer Brandie McNamee and staff supervisors at the Sheriff's Office. "Using all of our available monies, cutting costs and raising the taxes by only 46 cents per $1,000 will allow me to operate my jail for the next five years," he said. "Holding offenders immediately accountable and lodging offenders in jail until the judge makes a release decision helps keep all of Jefferson County safer." In the event that the jail levy is turned down a second time, in May 2019, the jail would operate normally through June 2019. When the Crook County inmates were gone, Adkins said that he would reduce the number of Jefferson County inmates to a maximum of about 24 inmates, and start laying off jail staff down to about 10 deputies. "I would institute a matrixing system, where I would only house the most serious offenders and release the less dangerous offenders," he said. "Those folks who are booked and released would have to be given a court date, to appear in court at a later date. If the person received a jail sentence from the judge, they'd be put on a waiting list to serve their sentence." But, Adkins is optimistic that it won't come to that, and in the meantime, he is continuing to look into possible contracts with other agencies. "Who knows what the future holds as budgets get tighter and other jurisdictions start looking for alternatives to their housing limitations," he said "As I look down the road eight and 10 years, I'm in a good position to rent jail bed space to another partner."